Founded in 2008, Castlight Health, Inc., is a San Francisco-based information company that offers a healthcare decision-making service, allowing users to compare and select providers. Castlight Health's growing workforce and body of clients prompted the company to expand in its location on Spear Street. The renovation afforded the opportunity to improve the experiences of its employees and clients, both existing and prospective. Working closely with Gensler's San Francisco office and Hogue, a Knoll dealer with whom Gensler had an existing relationship, Castlight Health set about creating a welcoming experience inspired by elements of hospitality. The design team aimed to create an open workplace that would encourage interactions and provide employees with the tools and spaces they would need to effectively work together. The design team faced the added challenge to plan a space that could morph and flex as Castlight Health continued to grow. To that end, the team designed an open entry space that would create an inviting welcome for guests, prospective clients, and Castlight Health employees. A standing-height hospitality counter in the reception area does double-duty as an impromptu conversation and casual meeting stop, thanks to its location adjacent to the two office's main visitor conference rooms. The team selected a mixture of height-adjustable workstations and table-based meeting and open lounge spaces, with Interpole™-supported white boards for team brainstorming. These decisions, which enable the dynamic activities of a collaborative office, also encourage greater movement and individual control over each workspace, improving office well-being. In the same vein, the team included a variety of complementary settings, including casual lounges and community tables to support team meetings, conversation, and untethered workstyles. 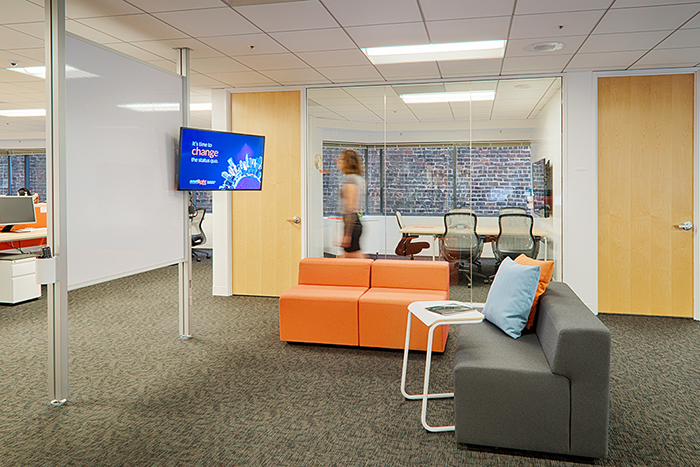 An intimate breakout space at Castlight Health uses Interpole to create a sense of privacy from the open workstations. The 15,000 square-foot office houses 112 workstations, seven conference rooms, five lounges, and a number of other support spaces. Through the variety of its spaces, the Castlight Health office has achieved the company's goal, creating a space whose priority is the visitor and client experience. In addition to providing a welcoming space for top-level meetings, supporting the company's need to attract new and repeat clients, the design has had a positive impact on Castlight's own employee community. The space has gone "beyond anything we'd done before in hopes of closing, retaining and renewing those key clients, as well as recruiting top talent," said a spokesperson for the project.